This is a sponsored post written on behalf of the Soyfoods Association for National Soyfood Month. All thoughts and opionions are my own. 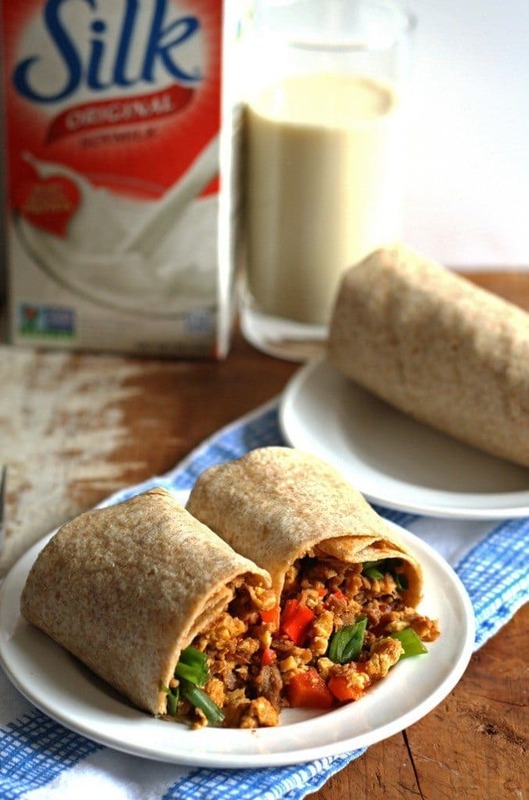 Start your day with this egg soy meat breakfast burrito and a glass of soy milk! Back in the day, I had periods of time where I called myself a vegetarian. I was never able to stick with it for very long, mainly because I survived on cheese sandwiches. While delicious, it was a pretty boring diet. I eventually caved out of food boredom. A few years ago, I discovered soy products which my vegetarian pseudo-self wished I had found sooner. I’m not just talking about soy milk, which I’m sure you have tried. I’m talking about soy burgers and soy “meat” crumbles. What a step up from those cheese sandwiches! Fast forward to present day. Would it surprise you to hear that my meat-and-potatoes loving husband asked me to make him this breakfast burrito again? It totally surprised me. He must know that April is National Soyfoods Month. 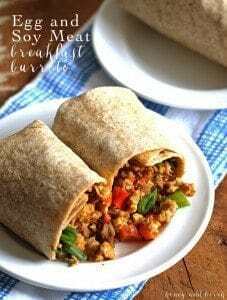 I want to be clear that soy meat is actually soy meat alternative – get all the info on what that means from the Soyfoods Association. 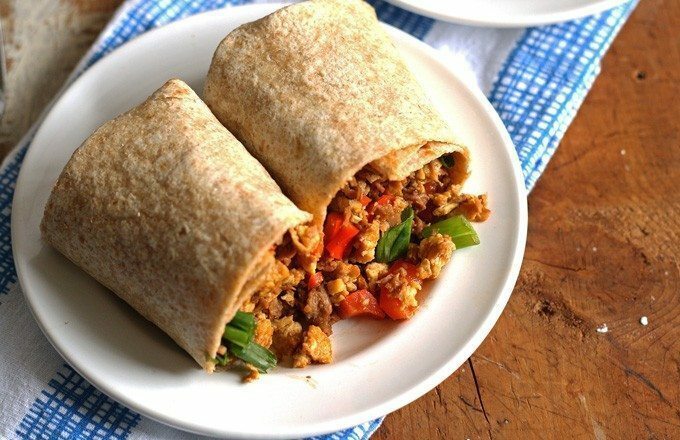 Morningstar Farms® Meal Starters Grillers® Recipe Crumbles™ are the star of this egg soy meat breakfast burrito recipe. The first time I made it, if I hadn’t told Mr. B that it wasn’t meat, he never would have known. You may think that I’m just saying that but really, he had no idea. After I told him, he said, “Wow, that was awesome.” I felt extra pings of love for my man because he is expanding his vegetarian food horizons. It tastes good, and is healthier than ground beef. Did you know ground beef has a whopping 4g of saturated fat!? High cholesterol runs in my family so this is something I’m very conscious of – crumbles are a great substitute since they have no saturated fat or cholesterol. Soy crumbles are perfect for your favorite chili, spaghetti sauce, tacos and more, and contain 75 percent less fat than regular ground beef crumbles, cooked (pan-browned). For that reason alone, I think you should give it a go. I like mornings to be uncomplicated, so easy breakfasts are key. 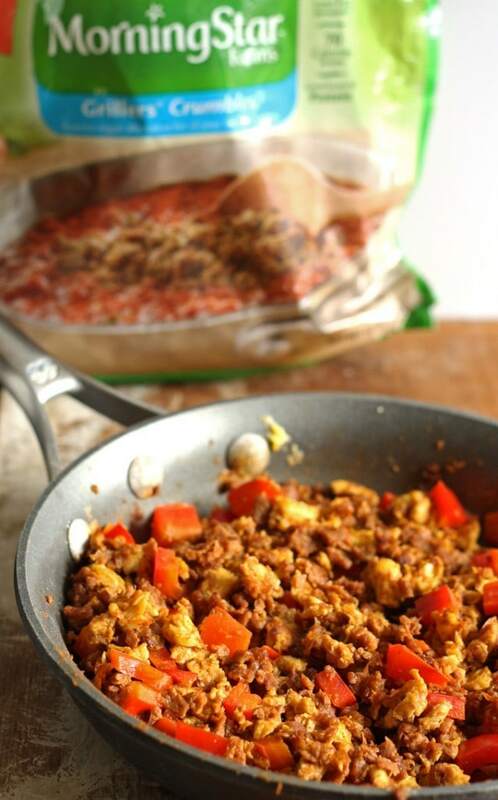 Start scrambling your eggs and when they’re halfway cooked, add the soy meat alternative. While that is cooking, chop up your red bell pepper and green onions to save time. I want the bell pepper to still be a little crispy so I add it to the egg/soy meat mixture for about 1 minute and then turn off the heat. The hardest part of this whole recipe is folding the burrito. 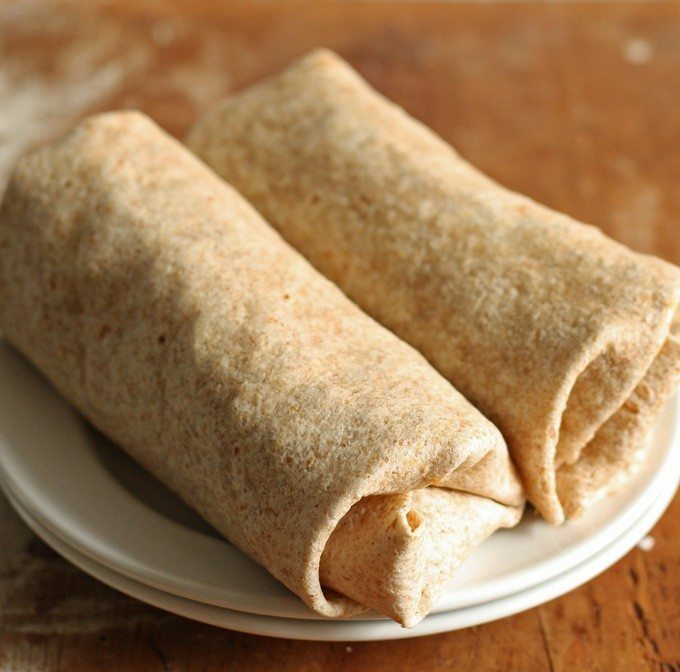 Fold, fold, tuck is my motto for burrito rolling. And… if you start having difficulty just grab a fork and eat. Save yourself the trouble and the time because it doesn’t need to be in the form of a burrito to be delicious. Start your day with this egg soy meat breakfast burrito and a glass of soy milk! Add 1 tablespoon of butter to a frying pan over high heat. While the butter is melting, whisk your eggs in a small bowl. When the pan is hot, add the eggs to the middle of the pan. Scramble the eggs with a spatula. When big lumps form, turn heat to low. Let rest for 2 minute and then add the soy meat alternative. Cook for 6 minutes, stirring occasionally. Add the taco seasoning, water and red bell pepper. Stir well. Cook for an additional 2-3 minutes. Remove pan from heat. Assemble your burritos. Pour half of the egg/soy meat mixture into the center of each burrito. Sprinkle half of the green onions into the burrito. Fold the sides of the tortilla towards the center, and roll the tortilla closed. Optional: fry the outside of the burrito in a pan. When you’re egg soy meat breakfast burrito is prepared, pour yourself a big glass of soy milk, like this one from Silk. What a great way to start off the day! Visit the Soyfoods Association’s website, or visit them on Facebook, Twitter, Instagram and Pinterest to find out more about how to swap out your foods for a more vegetable based diet. Thank you Soyfoods Association for sponsoring today’s conversation! Looks and sounds tasty! I have only more recently got in to breakfast burritos but they can be so great to start the day. 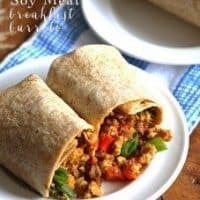 Really love breakfast burritos and these look yum!